Franklin County Visitors Bureau supports education and arts with participation in Stuff the Bus and First Friday in Downtown Chambersburg. 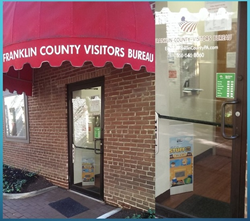 The Franklin County Visitors Bureau is located in the brick walkway between 103,7 and Olympia Candy. Stuff the Bus complements the DBC's August 5th First Friday. Franklin County Visitor Bureau (FCVB) is collecting school supplies for the United Way of Franklin County's annual Stuff the Bus campaign. Joining the collection drive of Chambersburg’s Downtown Business Council's (DBC), FCVB is accepting school supplies such as folders, pencils, chalk, copy paper, tissues, and more in the Stuff the Bus collection box through August 5. The office is located at 37 South Main Street in downtown Chambersburg and is open 8:00 AM to 4:30 PM. Bring school supplies to FCVB or another supporting business, including Wagner’s Supply Depot, Chambers Apothecary, Capitol Theatre, Ludwig Jewelers, Merle Norman, Here’s Looking at You, Gartenberg Jewelry, The Foundry, Olympia Candy Kitchen, Gift Enclosure, Café d’italia, and Lotus Moon Gallery and Yoga. The public can also drop school supplies in the Main Street Deli parking lot throughout the August 5 First Friday event, 5 PM to 8 PM. Stuff the Bus complements the DBC's August 5th First Friday, which celebrates the arts in school. Chalk art is planned for the southwest quadrant of the square in front of Central Presbyterian Church. Local students of the Cumberland Valley Christian School's Praise Band will perform in the second block of South Main The Corpus Christi robotics club will demonstrate the art of science in action on the southeast quadrant of the square, near F&M Trust. Also, find out more about the value of artistic expression from representatives of Cumberland Valley School of Music and enjoy free face painting, fun photos by the Franklin County Photographers Club, plus art displays, great First Friday sales, and musical entertainment.